When planning travel to Mexico you should consider the weather and seasons so you can make informed decisions about where to go and what to pack. Many people automatically assume that the weather throughout Mexico is always hot, but that's not the case. Mexico is a large country and its weather can vary greatly from one destination to another. The weather in Mexico is determined not only by latitude but also by altitude. Mexico has tropical forests, dry deserts, fertile valleys and snow-capped mountains. Since Mexico's terrain is extremely varied, so is the weather. On the coast, the climate is generally balmy year-round, but some months are rainy and others dry, and Mexico City can have days that are quite chilly, and nights that are downright frigid. In Mexico, there are two main seasons. Although there is some variation in temperature over the year, the most obvious difference is between rainy and dry seasons. The rainy season through most of Mexico falls roughly from May through September or October. During the rest of the year, there is little or no rain. Don't be discouraged from visiting during the rainy season, when you'll see lush, green landscape, as opposed to the dry season's parched, brown landscape - and it often only rains in the late afternoons and evenings. Hurricanes and other natural disasters can ruin your vacation. Before heading to Mexico during hurricane season (June to November), check the weather forecasts and read up about precautions you can take. There are regional variations to Mexico's weather which we will look at in more detail below. 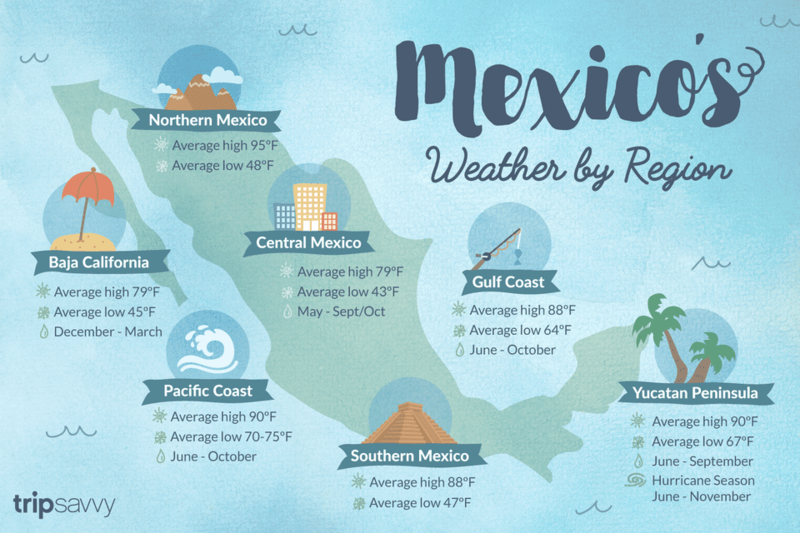 Read on to learn about weather conditions in different areas of Mexico, and to see average annual temperatures for various destinations. Mexico's Baja Peninsula comprises the states of Baja California and Baja California Sur. The total area of the Baja California Peninsula is 55 360 square miles (143,390 square kilometers), and it is over 680 miles long (1100 km). The climate in Baja California is temperate and rather dry, with Tijuana receiving an average of 9 inches (235 mm) of rain annually, and Rosarito 11 inches (273 mm), mostly between December and March. The Sierra mountain range divides the state and at the higher altitudes in the center of the state,​ there is more rain. This is Mexico's wine-producing area. Toward the south of the state there are desert areas, with scorching summers and cool winters. Average temperatures in Tijuana range from a high of 79F in September to a low of 45F in December. The southern part of the Baja Peninsula has warm winters and hot summers with occasional refreshing breezes. The coast of the Sea of Cortes generally has warmer temperatures than the Pacific coast. Los Cabos receives an annual average rainfall of 10 inches (25 cm), which falls mostly in September and October. In inland northern Mexico, the weather is generally arid and varies a great deal throughout the year. During the summer months, it can be very hot, with an average high of 95F in August. Temperatures drop in winter, with north winds bringing a chill—January sees an average low of 48F. There is occasional snowfall in winter, so be prepared. One of northern Mexico's most important tourist attractions, the Copper Canyon, has distinct climates at the highlands and in the valleys, so visitors are advised to dress in layers to be able to bundle up or strip down for comfort. Inland central Mexico has spring-like weather—it's warm or hot during the day, and cools down come nightfall. Cities at high altitudes, like Mexico City (7349 feet/2240 m) can be quite cold at times, particularly at night, so pack accordingly. The warmest months of the year are April and May, with average high temperatures at 79F. Then the rains start and temperatures go down. ​The rainy season lasts from May through September or October, and the coldest months are December and January—the average low then is 43F. Mexico's Pacific coast region, known as the Mexican Riviera, has warm to hot weather throughout the year. Rainy season is from June to October, with rain mainly falling in the late afternoon or evening. Annual high temperatures fall around 90F and lows around 70-75F. In Mexico's southern region, including the states of Oaxaca and Chiapas, the climate is similar to that of central Mexico, but cities at high altitudes (like San Cristobal de las Casas) are substantially cooler. Oaxaca sees average highs of 88F in March, and average lows of 47F in January. Mexico's Gulf coast region is among the most humid areas of the country, with Veracruz receiving 78 inches (2000 mm) of rain annually, with most rain falling between June and October. The weather here is generally hot year-round. The region sees an average high of 88F in September, and a low of 64F in January. The Yucatan Peninsula is very flat and very close to sea level, so temperatures are quite warm throughout the year. Temperatures inland are somewhat higher than on the coast. Annual precipitation varies from 60 inches (1524 mm) along the Mayan Riviera to half that - about 30 inches (777 mm) - in Merida, falling mostly between June and September. Average high temperatures reach about 90F in July in August and lows fall to 67F in January. Hurricanes are a concern along the Caribbean coast of the Yucatan Peninsula between June and November.